Some times you just need a change! Don't change out of the whole bed when you can just purchase a head board! This Red Cedar Log head board is made from REAL stripped logs and then sanded and lacquered for a beaultiful gorgeous finish!! There will be no worries about this head board! It will last for years to come! NOTE: Photo shows headboard in King size, you select the size above. The scent and beauty of natural Red Cedar Logs is unmatched! 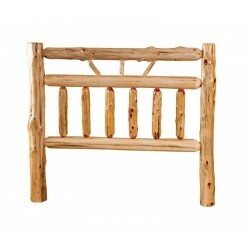 An excellent choice for a rustic mountain lodge, ski cabin, country cottage, and much more. Red Cedar logs have a beautiful light tone on the outside and striking bright red cedar coloring on the inside. Constructed by skilled Amish craftsmen, our items are sanded and lacquered for beauty and durability. Sturdy and substantial, these items will last generations.